As the heat of summer approaches, the number of events in India dwindles. However, there are a few festivals that will be a highlight of your trip. Here's the best of what's on in India in April, listed by 2019 dates. Spring is when Kashmir is at its most picturesque, and is also the season for flowering tulips. This special time of year is beautifully captured by the Tulip Festival in Srinagar, home to Asia's largest tulip garden. As well as the arresting sight of more than a million blooms, the festival features daily cultural programs, Kashmiri folk songs, sale of local handicrafts, and traditional Kashmiri cuisine. This year, there are more than 50 varieties of tulips and several new fountains installed in the garden. When: First two weeks of April. Once deadly headhunters, the fascinating Konyak tribe now lives peacefully, spending most of their time practicing agriculture, drinking local alcohol, smoking opium (and occasionally hunting). After having completed the sowing of seeds each year, the tribe celebrates their most important festival, the Aoling Festival, which marks the beginning of spring season and a new year. Where: Mon district of Nagaland in North East India. Where: East Siang and West Siang districts of Arunachal Pradesh in North East India. Festivities take place on a grand scale at Mopin Ground, Naharlagun, near capital city Itanagar. Another popular type of temple festival in Kerala, the Nenmara Vallangi Vela occurs after the paddy harvest. Two neighboring villages compete with each other to put on the best display of traditional art forms and percussion music performances. There's also a procession of decorated elephants. Where: Nellikulangara Bhagavathy temple, Nemmara, Palakkad district, Kerala. In contrast to many of Kerala's temple festivals where the focus is on elephants, the Attuvela Mahotsavam is a delightful water carnival. During the festival, a procession of warmly illuminated canoes carry huge temple replicas through the water towards the temple. They're accompanied by lots of colorfully decorated small canoes and temple percussion music. Where: Elankavu Sree Bhagavathy temple, Vadayar, Kottayam district, Kerala. Gudi Padwa, the Maharashtrian New Year, sees huge parades taking place across Mumbai. The biggest one happens in the morning at Girgaum, in south Mumbai. Locals turn out wearing their finest traditional clothing, many dressed to reflect the reign of great warrior Chhatrapati Shivaji. The parade also features sari-clad women riding motorbikes, and more than 50 floats depicting the culture of the state. The famous 600-year-old Karni Mata temple is home to thousands of rats, which are considered to be sacred. The temple is dedicated to an ancient mystic who's believed to have been a reincarnation of the Goddess Durga, and the souls of Karni Mata's devotees are said to reside in the rats. Twice a year, during Navaratri, devotees come to the temple to worship the goddess. Food is offered to her, and it's considered most auspicious to eat what the rats have salivated over. Even better, let them run over your feet for added good luck! When: April 6-14, 2019 and September 29-October 7, 2019. Where: Karni Mata temple, Deshnok village, around 45 minutes south of Bikaner in Rajasthan. This is a festival you won't forget in a hurry! Thousands of sword-wielding oracles, both male and female, swarm the temple premises. The oracles run in around a trance and proclaim their communion with the Mother Goddess. Meanwhile. devotees strike the temple rafters with sticks​ and hurl offerings over the roof and onto the quadrangle. It's one of the quirkiest festivals in India. Where: Kodungalloor Bhagavathy temple, Kodungalloor, Thrissur district, Kerala. 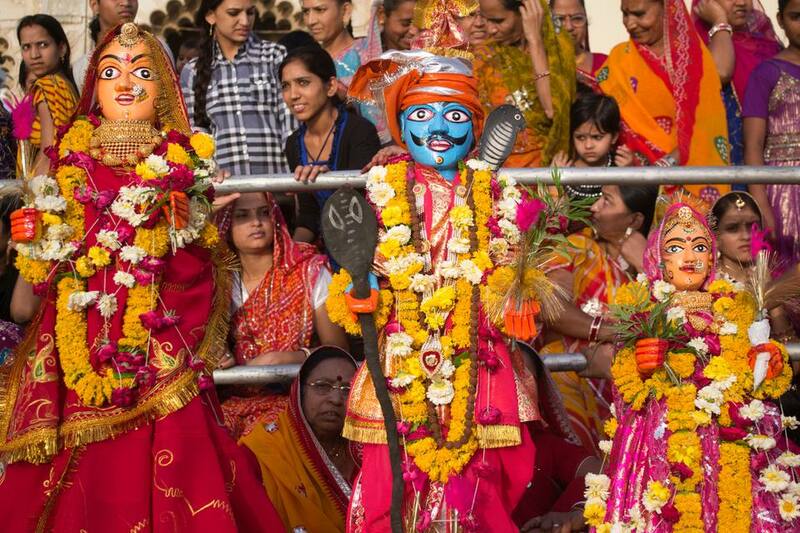 One of the most important festivals in Rajasthan, Gangaur is all about honoring the goddess Gauri. A manifestation of Parvati (Lord Shiva's wife), she represents purity and austerity. This festival is predominantly for women. Colorful processions of bejeweled images of the goddess Gauri wind their way all over cities and villages, accompanied by local bands. Where: All over Rajasthan. However, the festivities in Jaipur, Udaipur, Jodhpur, Jaisalmer, Bikaner, and Nathdwara are the most notable. At Gangaur Ghat, on the banks of Lake Pichola in Udaipur, images of goddess Gauri are transferred onto boats amidst much singing and and taken out onto the lake. The festival continues with more singing, dancing, and cultural programs and finishes off with a huge display of fireworks. It's a fantastic opportunity to see a range of traditional musical instruments being played. The Chithirai Festival is one of the biggest celebrations in Madurai. It re-enacts the wedding of Lord Sundareswarar (Lord Shiva) and Goddess Meenakshi (Lord Vishnu's sister). Legend has it that Lord Vishnu came to Madurai, mounted on a golden horse, to witness the wedding. Where: Meenakshi Temple, Madurai, Tamil Nadu. The festival of Ram Navami marks the birthday of Lord Ram, the seventh incarnation of Lord Vishnu. It's celebrated in a religious manner all over India. Where: Major celebrations and processions take place at Ayodhya in Uttar Pradesh, Bhadrachalam in Andhra Pradesh (there's a popular ceremonial wedding of Ram and Sita), and Rameshwaram in Tamil Nadu. Baisakhi is a harvest festival, a Punjabi new year festival, and commemoration of the founding of the Khalsa (Sikh religion brotherhood) all rolled into one occasion. It's celebrated with a great deal of feasting, bhangra dancing, folk music, and fairs. Major celebrations are organized at the Golden Temple in Amritsar, and it becomes carnival-like outside. There's also a street procession. Where: Throughout the state of Punjab, particularly in Amritsar. Bihu is the main festival of Assam, in Northeast India. This agricultural festival occurs three times a year but the biggest celebration, known as Bohag Bihu or Rongali Bihu, happens in April. It's celebrated for three days and marks the start of the new year there, as well as seeding time in spring. The first day is dedicated to the cows, which are vital to agriculture. The second day is spent visiting friends and relatives, along with plenty of singing and dancing. On the third day, deities are worshiped. Patayani is an ancient ritual art form of southern Kerala. It's performed to appease the deities of certain temples, and is carried out by villagers accompanied by traditional music and drumming. The performers dress up in costumes consisting of huge masks. The main ones embody Bhairavi (Kali), Kalan (god of death), Yakshi (fairy) and Pakshi (bird). Where: Kadammanitta Devi temple, Pathanamthitta district, Kerala. The first Sankat Mochan Music Festival was held in 1923, and since then it's attracted acclaimed classical musicians and dancers to perform from all over India. Recitals are held every evening in the temple courtyard and go on until dawn, as part of Hanuman Jayanti (birthday of Lord Hanuman) celebrations. Where: Sankat Mochan Hanuman temple, Varanasi, Uttar Pradesh.